You might think that, with a job like mine, I’d be an extrovert. I’ve taught thousands of students. I’ve given dozens of invited talks. I’ve done a hundred or so radio interviews, and have even appeared on TV a few times. But I don’t come by extroversion naturally. 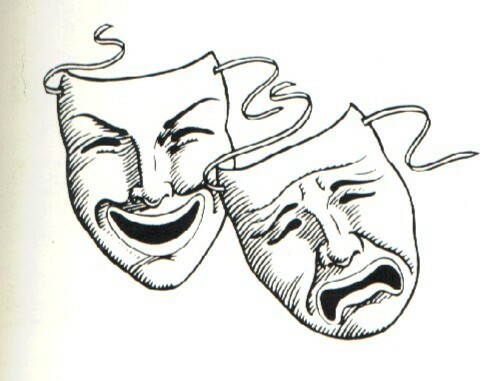 It’s something I’ve learned to perform, a role I play, a character I impersonate. I’ve become so adept at this impersonation that, on those rare occasions when I’ve mentioned my native shyness, the general response has been disbelief. It’s taken me a while to get here, though. It began, as many things do, in adolescence. As a sixteen-year-old, I happened into a minor role — the Second Dead Man in Thornton Wilder’s Our Town. The director, Terrence Ortwein, was my teacher for a “Theater 101” class. The student originally playing that role got expelled, and Mr. Ortwein asked me if I would undertake it. I agreed, memorized the part, and began to attend rehearsals, where I became an extra in other scenes. Though it was a bit nerve-wracking to be on stage, I also found that… I could do it. I went on to have minor roles in Spoon River Anthology, Grease, Oliver, and Rogers and Hammerstein’s Cinderella. I lacked the confidence (and, no doubt, the ability) to land a major part, but I was glad to be a member of each cast. I have no idea why Mr. Ortwein thought I could do it. Perhaps he thought it would be good for me? It was good for me. Acting allowed me to a glimpse a different self. It taught me that I could discard the script I had been using and try a new one. When I set off for college, I decided that my tendency towards introversion was unhealthy. Thus, I would deliberately cast myself in roles that required me to interact with others. As a freshman, I ran for dorm council president … and won. I also applied to become a Resident Advisor, and became one of two sophomore RAs the following year — a job I held through my senior year. I joined the Arts Committee (a student group), and became president of it for a year, too. In each case, I figured that the job would force me to rise to the occasion. It did. Inhabiting these new roles wasn’t easy: I had no leadership experience whatsoever. But I managed. Though this seems silly to me now, for each of those dorm council meetings, I would print up and then photocopy an agenda. Having an agenda gave me a script. It helped me to perform. Learning to teach was much harder. I say “was,” but I should probably say “has been” because it’s something I’m still learning to do. (And I hope I’m getting better at it!) Teaching was and is harder because it can’t all be acting. It also has to be you. You have to develop a teaching persona that’s a version of yourself — the classroom version. I’m sharing this personal narrative because I sense that many “book people” — in which I include academics, librarians, writers, artists — are introverted, or at least tend in that direction. Yet, as Morrissey sings in the Smiths’ “Ask,” “Shyness is nice, but shyness can stop you / from doing all the things in life you’d like to.” So, many of us bookish folks have learned to perform a more extroverted version of ourselves. Indeed, we might even create such a successful “confident” persona that most people would be surprised to learn that they’re talking to a naturally shy person. One of the most liberating things I learned in college was that, although psychologists study personality, it’s nearly impossible to prove that such a thing as “personality” exists at all. This insight affirmed my sense of the self as malleable: you may feel shy or insecure, but you don’t always have to be that way. You can change. Years of acting have changed my personality. I’ve become more extroverted. I enjoy socializing. I like giving talks. But I’m also glad when the talk finishes, the party’s over, and I can go home again. Images: Comedy and Tragedy masks (from FanPop! 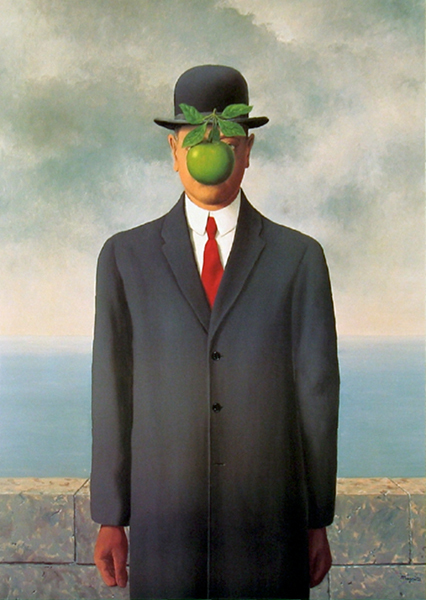 ); René Magritte, The Son of Man (1964). Explanation for the Images: The first is obvious. The above piece discusses theatre, after all. The second — the Magritte painting — is here because it’s a self-portrait in which the artist has hidden his face, which is also a motif of this narrative. Nice post, Phil. I’ve often thought some sort of theater training should be–or at least could be–part of graduate programs. a friend of mine who specializes in Myers-Briggs analysis insists that shyness and introversion are not at all synonymous. Introverts need solitude in order to recharge and have energy–but they may actually not be shy at all. Like a lot of us, I’m both, but–like you–have figured out how to perform extraversion in certain circumstances. Still, it can be exhausting, and there are still times when I just can’t do it. Almost never in class or other professional circumstances where there’s a defined role, though. It was also a big shock to me to learn how underrepresented introverts are in the general population–so, most people really don’t understand that need for quiet and solitude that introverts have, which can make it even harder to get it. Very interesting post. I would say that librarians achieve much the same effect through storytelling. I would second Libby’s point that shyness and introversion are not synonymous. I not introverted, but I am shy. I did a lot of acting in high school and undergrad, and I love presenting papers at conferences. Presenting doesn’t make me nervous at all–it’s a performance, which I know how to do–but interactions with strangers between sessions are terrifying. Maybe if I can start thinking of those sorts of interactions in terms of performance, I would improve. The point about the malleability of personality is also helpful–thanks for that. Thanks, all, for your comments! Libby and Matt: You’re correct. I was using “shy” and “introverted” more or less interchangeably. Thanks for drawing the distinction between the two. If I may use your distinction to clarify the above, I suspect I have elements of both shyness and introversion, though (above) I was speaking more of the former than the latter. Mostly, neither are issues for me anymore. Only once in recent memory did they become so. I’d been invited by a senior scholar to deliver the first talk on children’s literature at his university. Though I perspired a lot, the talk and Q+A both went well. After it was over, though, I was sure I’d bungled it and wished I could disappear. The senior scholar assured me that it went well, but I suspect my repeated doubts rather tried his patience.